Venue - Cliftons, 440 Collins St, Melbourne. Innovative, experiential learning to equip managers with the skills needed for the new world of work. This one day workshop is based on Jurgen Appelo's Management 3.0 and Managing for Happiness. We take several of the workshop activities from that training and do a one day, activity focused version of the usual 2 day training. This course focuses on how to improve the performance of teams, mainly through activities that enhance mutual understanding and empathy. Activities include Delegation Poker, Moving Motivators, Personal maps, and more. It is a great way to follow up on prior Management 3.0 training, but is also a great way to enhance your toolkit as a manager. Read Craig Brown's (Management 3.0 Facilitator) interview about this course. Tabar has a unique relationship with Jurgen Appelo, the creator of Management 3.0. We are pioneers of Management 3.0 in Australia and New Zealand, having brought Jurgen to Sydney, Melbourne and Auckland on multiple occasions. Jurgen was the keynote speaker at Tabar's Dare Festival in 2014, and 1st Conference 2017. 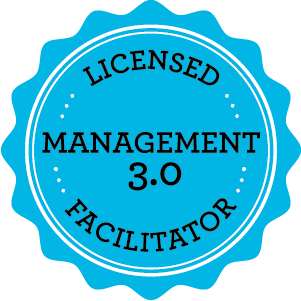 We have run MGT 3.0 courses in Melbourne, Sydney, Perth, Auckland and Wellington since 2012.
Who is Management 3.0 for? This course is aimed at managers and leaders who want to increase organisational agility. It's desgined for people who want to lean agile leadership and agile management skills. No practical experience with Agile methods is necessary, though some familiarity with Agile principles and practices can be useful. Complexity Thinking and systems thinking are the cornerstones of an Agile mindset. You will learn what complexity theory is, how to think in terms of systems, and about the difference between complex and complicated. Align Constraints - self-organization can lead to anything, and it’s therefore necessary to protect people and shared resources, and to give people a clear purpose and defined goals. You will learn when to manage and when to lead, how to use different criteria to create useful goals, about the challenges around management by objectives, and how to protect people and shared resources from any bad effects of self-organization. Change Management - people, teams, and organizations need to improve continuously, in order to defer failure for as long as possible. In practice this means that managers and leaders must act as change agents, trying to change the social complex systems around them. You will learn about the 4 facets of change management, which address the system, the individuals, the interactions, and the boundary of the system. M3.0 has a series of games and exercises where people can put into practice the ideas of the course in groups of five or six people. Sometimes people play as different managers against each other. Sometimes they act together as one manager, sharing their thoughts while working on a problem. The exercises include Personal Maps, Team Diversity, Method Map, Biggest Challenge, Complexity Thinking, Moving Motivators, The Ellen Game, Delegation Poker, Agile Goal Setting, Metrix Matrix, Meddlers, Change Agent, Celebration Grid and Kudo Cards. Every activity ends with a debrief and a discussion, so that people can relate what they've learned to their own situation, and bring up questions and experiences to be addressed by the whole group. Peter Lam is formerly the Head of Projects at the largest e-commerce payment company in Australia where he introduced an Agile PMO. He has lead onshore and off shore teams; internal and outsourced environments; and integrated waterfall and agile approaches within broader programs of work throughout Australia, New Zealand and Asia. In addition, Peter selects, trains and supports presenters at Agile conferences (including Agile Australia, 1st Conf, LAST, Spark the Change), and leads events in the agile community. If you would like us to contact you to help you understand if this course is right for you, please fill in this form.